Mauro "Goose" Gozzo's major league debut in August 1989 consisted of an eight inning outing, one where he gave up three hits and no runs against the Rangers. But Gozzo tried to keep it in perspective. "I've always tried to have fun wherever I pitch," Gozzo told The Associated Press after that game. "I'm not the type of person who lets everything get to him. The bottom line is, it's just a game and if you can't have fun playing it, you shouldn't be out there." For Gozzo's first four major league outings, it would have been easy for anyone to have fun. He picked up wins in all four. The real test for Gozzo, though, came over the next five years. Gozzo wouldn't get another big league win until 1994. He got three more wins that year, ending his big league career after six seasons. Gozzo, though, has gone on to be a private coach, helping one pitcher, the Giants' Matt Cain, improve his skills and watching him make the majors. Gozzo's professional career began in 1984, taken by the Mets in the 13th round out of Berlin High School in Connecticut. Gozzo stayed with the Mets for three seasons, including an 11-4 year at single-A Columbia in 1985. In March 1987, the Mets sent Gozzo to the Royals in the five-player deal that sent David Cone to the Mets. Gozzo pitched two seasons in the Royals system, both at AA Memphis. 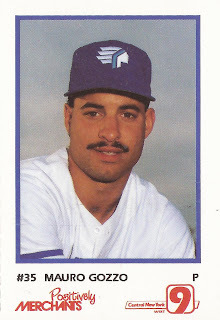 Left unprotected after 1988, the Blue Jays selected Gozzo in the minor league draft. Not a year later, Gozzo was in Toronto. Gozzo started 1989 at AA Knoxville. He went 7-0, with a 2.98 ERA and earned a trip to AAA Syracuse. There, Gozzo went 5-1, with a 2.76 ERA and earned a trip to Canada. After that debut against the Rangers, the Blue Jays and Gozzo headed to Boston and Fenway Park. It was the team the Connecticut-native grew up rooting for. Gozzo gave up one earned run over five innings, picking up his second win. "I'm ecstatic just being here pitching in the big leagues," Gozzo told The AP after that game. "It's one big thrill, a dream come true." Gozzo then beat the Orioles in Baltimore. A relief appearance then resulted in Gozzo's fourth victory. But, as the Blue Jays worked toward the division title, Gozzo got into just five more games. He was also left off the post-season roster. Gozzo then spent 1990 back in the minors, at Syracuse. In September, the Blue Jays sent Gozzo to the Indians, the player to be named in an earlier deal. Called back to the majors, Gozzo got into two games, three innings, without giving up a run. Gozzo got two more outings for the Indians in 1991, starts. Gozzo went just a total of 4.2 innings, giving up 10 earned runs. By 1992, Gozzo was in the Twins system, signing there as a free agent. "I feel I have the stuff to pitch in the major leagues," Gozzo told his hometown Hartford Courant in July 1993, as he pitched for AAA Portland. "I just have to get a chance with the right team at the right time." Gozzo arrived in Minnesota in September, again getting into just two games. In 1.2 innings of relief work, Gozzo gave up five earned runs. Gozzo arrived back with the Mets, the team that drafted him, for 1993. He got 10 outings in Flushing that year, picking up a loss, but posting an ERA of 2.57. The next year, what would be his final year, Gozzo got the most big league playing time of his career. He got into 23 games, starting eight. He went 3-5, with a 4.83 ERA. His final game came the last game before the strike began. That May, Gozzo got his first start in the majors in three years. To The Courant, Gozzo called the Mets "probably the best opportunity I've ever had." "I can't complain now, to be up at this point of the season with a team that's close to my hometown, a team that has a need," Gozzo told The Courant. "I've grown to accept that this is a job, a profession, and I just have to put the uniform on and be ready to go." Gozzo ended his career in 1995, pitching with the Cubs at AAA Iowa. Gozzo, though, has gone on to be a coach, including serving as the personal pitching coach for Matt Cain. Gozzo was even there in San Francisco for Cain's 2005 big league debut, watching him work out of a bases loaded jam against the Rockies. "I think he's doing great," Gozzo told The AP. "That was a great inning for him, his first pressure inning in the big leagues with the bases loaded and no outs. One thing, he's got to keep his pitch count down. At 20 years old, he's a phenomenal talent." Spokane Spokesman-Review, Associated Press, Aug. 10, 1989: Jays pitcher wonders: Is it a dream?